Aggregate demand: AD = 1000 + 0.75Y. Marginal propensity to invest: MPI = 0.15. Product gap is equal to 120.
a. Find the Keynesian multiplier (K), Deflationary gap and Product of full employment (YF). Is it correct? I solved it without using MPI which is 0.15. Now assume that the government was interested in bringing the economy to equilibrium in full employment. Find the change needed to achieve the goal and the change in product (Y), investment (I), public consumption (G) and private consumption (C), by increasing public consumption and financing it by selling bonds. Last edited by skipjack; May 6th, 2018 at 04:05 AM. I think this problem just involves algebra applied to a model that you have not fully specified. MPE is what? MPI must be 0.15 times something or else it is a ratio of two somethings, but what somethings? For us to help you, you need to give us the definitions and equations of the specific model that you are working with. I can tell it is essentially a Keynesian model, but which one? Are we dealing with IS and LM curves, for example? If you are working with the Hicks version of Keynes, I'd have to spend a fair amount of time refamiliarizing myself with it. MPE is marginal propensity to expenditure. MPI, which is 0.15, Refers to investment (I) and product (Y), in other words, MPI is the increase in investment (I) as a result of the growth of product (Y). 1. The Keynesian model - an economy in which the government doesn't intervene in economic activity. 2. The Keynesian model - a closed economy in which the government intervenes in economic activity. So we didn't learn about Hicks yet. The curves I know for now are private consumption (C), investment (I) and AD=C+I or AD=C+I+G (if there is public consumption which is G). So I don't know what are IS and LM, I think we're dealing with what I just mentioned. Y* (if you saw in picture) = equilibrium product. Is there a name for the "1000" term in the equation AD = 1000 + 0.75Y? Also, is there a standard abbreviation (or letter) that's usually used for the product gap? I ask because after finding K, you effectively calculated 1000K + 120 and 120/K. About your first question - no, it's just number. About your second question - I don't know, nobody told us about special letter of product gap. Yes, 1000K+120, it's all about formulas. about 120/K I'm not sure (even if you got the same answer), I just calculated in different way, but if it's the same mathematically, so yes. Professional economists build models (mathematical or conceptual). There are probably dozens of slightly different versions of Keynes, partly because his General Theory is amazingly opaque. Here is a site that gives a very short summary of non-Marxist macroeconomic theories. You seem to be studying a simple Keynesian model. And there is admittedly very limited variation in these primitive models. But vocabulary may differ. What you call marginal propensity of expenditure is, I suspect, what others call marginal propensity to consume, but I am not sure of that. The term "deflationary gap" is unfamiliar to me and seems to involve the general price level, which is not an element in the simple Keynesian models that I am familiar with. And the behavioral equations in even simple Keynesian models may vary slightly. What are the defined terms in the model. $Y = C + S + T$. That gives six variables and only two equations. What are the other equations? But why should I guess when you can tell me for sure what your equations are? Last edited by JeffM1; May 6th, 2018 at 06:59 AM.
. . . about 120/K I'm not sure . 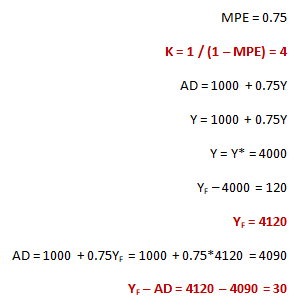 . .
You effectively obtained 4120 - 4090 from 1000 + MPE*4000 + 120 - (1000 + MPE(4000 + 120)). That simplifies to 120(1 - MPE), which is 120/K, as K equals 1/(1 - MPE).